With emergent plants, or plants with the aerial advantage, Walstad means all sorts of plants whose leaves are not submerged in water. These can be land plants, amphibious plants like Anubias and Echinodorus species, floating plants like duckweed and water hyacinth, water plants with emergent leaves like water lilies and lotus. Emergent plants receiving preferably natural sunlight can purify water much better than the most high-tech manmade filter can do. The faster a plant grows the faster it purifies water. Keeping emergent plants for water purification is almost mandatory in order to keep sensitive fish like Apistogramma species. The services of emergent plants can hardly be replaced by hightech filters and tedious maintenance work like frequent water changes. 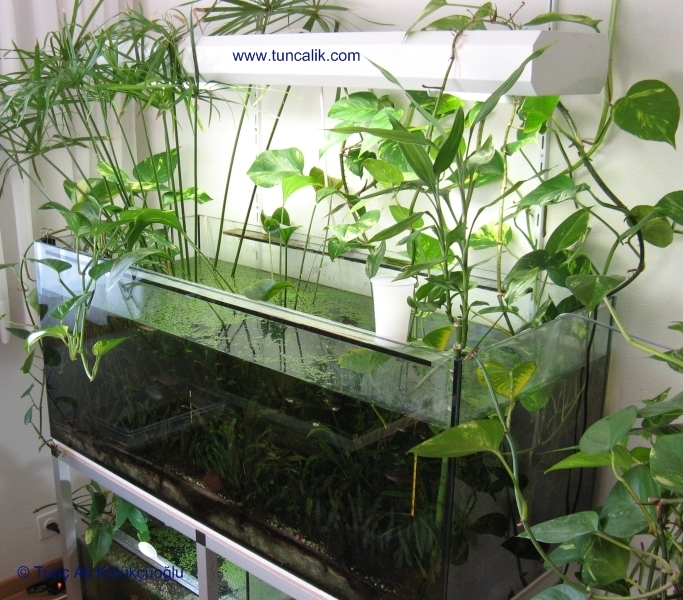 Besides amphibious plants like Anubias and Echinodorus species I use a number of common indoor (room) plants in my aquariums for water purification. That is, for reducing all kinds if organic and inorganic contamination such as ammonium, nitrite, nitrate, phosphate etc. You may find below an image gallery of these plants. 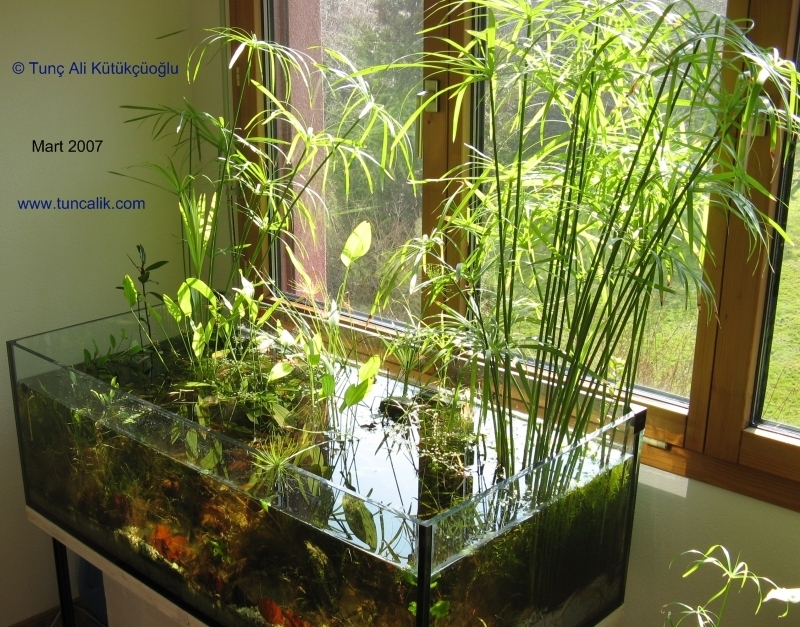 Most fast growing and robust indoor plants suitable for hydroculture can be used in aquariums or tropical ponds for water purification. The vigorous Monstera deliciosa, a kind of creeping vine, is one of the best water purifiers among indoor plants which needs but lots of space for growing. I tried every plant in the list above except for Monstera deliciosa with good results excluding the two Syngonium species I had kept. I can highly recommend Golden pothos (Epipremnum pinnatum) for every aquarium lover. It is robust and adaptable, and it grows fast. 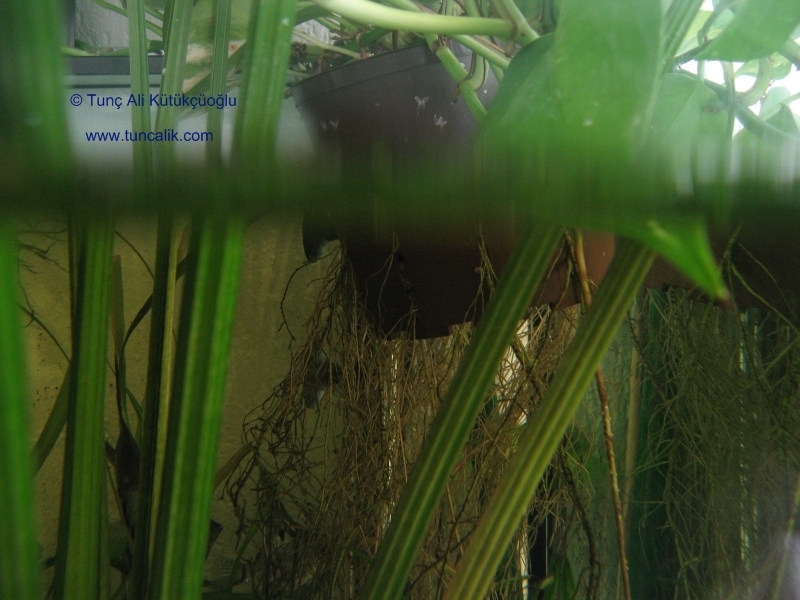 Its dense roots look very natural and decorative in an aquarium providing hiding places for shrimps and small fish. It can easily be propagated vegetatively by just cutting side shoots that can be put in a vase filled with water. The roots will appear in several weeks. 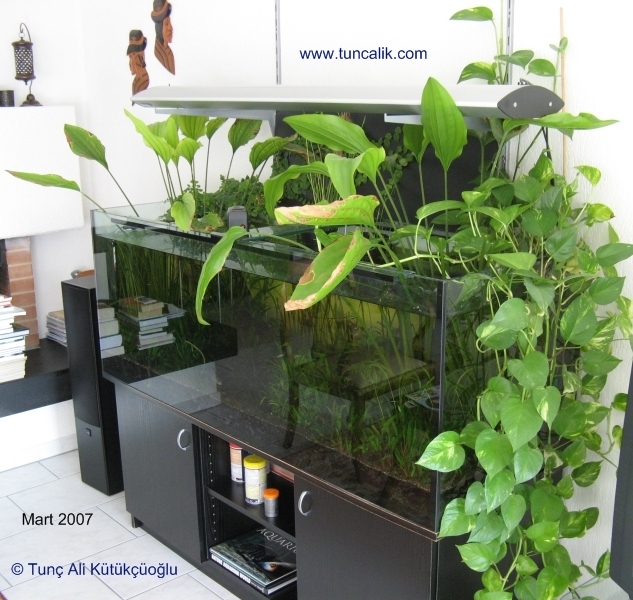 You don’t even necessarily need a hydroculture pot for inserting the plant in an aquarium. 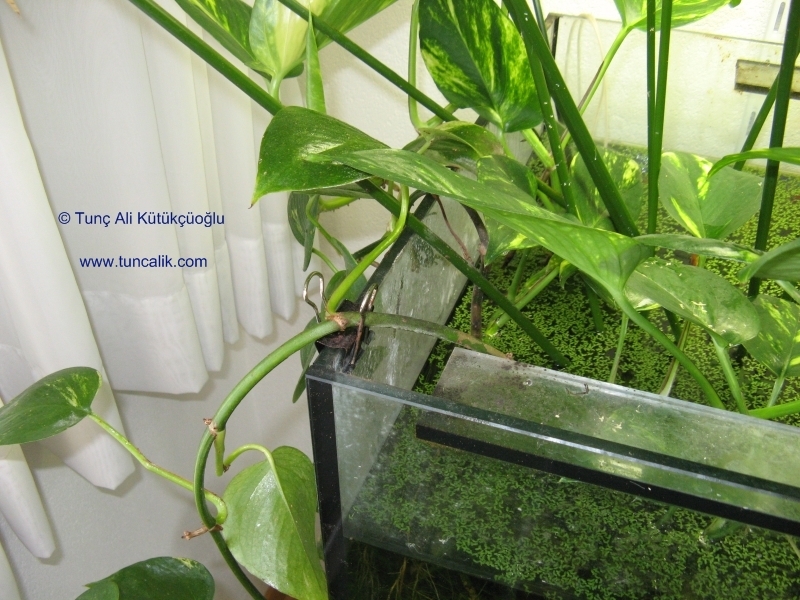 A piece of Epipremnum pinnatum attached to the side glass will soon grow roots in water (see the related picture below). Umbrella papyrus is an excellent plant for large aquariums and ponds. Under natural sunlight it may grow as high as 1.5 meters (5 feet). 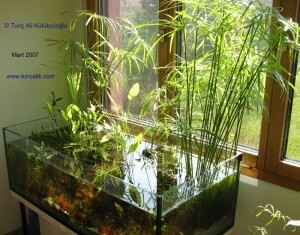 It can be planted directly into the bottom substrate provided that the water depth is less than 40 cm (16 inches). It is a robust and fast growing species. As a fast growing plant it keeps the bottom substrate healthy through its vigorous network of roots. It is a perfect water purifier water Malawi and Tanganyika tanks because it can easily adapt to higher pH degrees. Climbing fig (Ficus pumila), also a most robust and adaptable species, is a slow growing but persevering plant like Anubias. It may take years to grow, but once grown, it is a very decorative plant and a perfect water cleaner. Given time, climbing fig can cover the back wall above an aquarium. It can hold and grow much easier if the wall is covered with a cork plate. 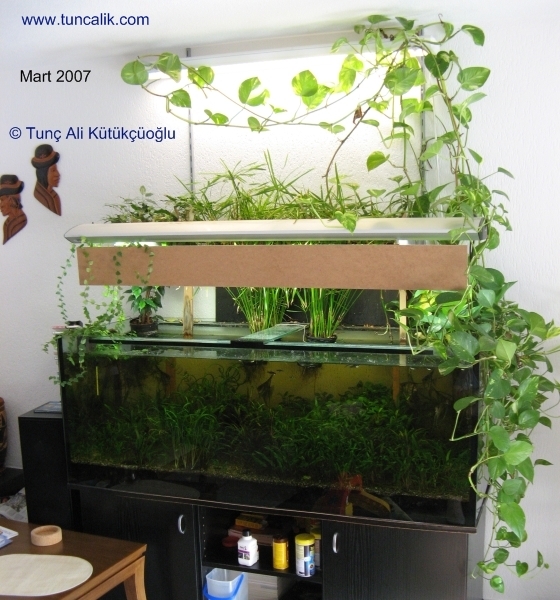 This entry was posted on Wednesday, January 20th, 2010 and is filed under Natural aquariums. You can follow any responses to this entry through RSS 2.0. You can skip to the end and leave a response. Pinging is currently not allowed. What are those millions of itty bitty green specks floating in the last photo? Is it duckweed? You have a very nice setup. The first photo with the papyrus is amazing! I must say that this is very nice web and well written articles. I use the same method you described with pothas, also read Walstad’s book. With loads of flowers you have healthy fish and clean water. However I am wondering whether water can be purified also by leaves, not only roots. I have submersed leaf of Monstera in my aquarium. Do you have any experience with that? Do you also use artificial light sources (I must rely on them). I am looking forward for more articles about your aquariums and some new photos. No, I don’t have experience with submerse leaves of plants like monstera. By just guessing, I don’t think the submerged leaves of marginal plants or climbing ephiphytes can survive in the long term under water. And surely, some leaves must remain out of water to get enough light and carbondioxide to pump up photosynthesis. There will be no water purification without sufficient photosynthesis. Except for my natural aquarium (the first picture above) I use artificial lights for all of my aquariums. 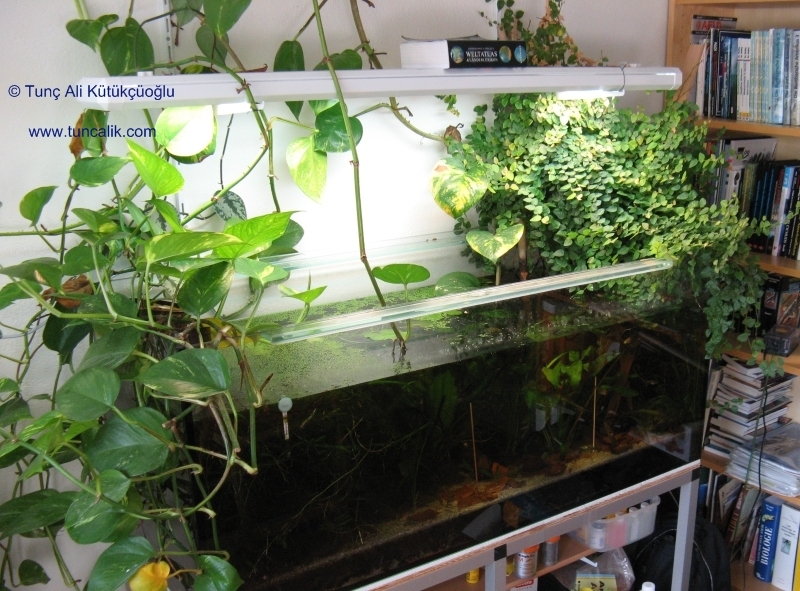 Most plants like papyrus and golden pothos seem to like natural sunlight and grow well only if there is some sunlight. But surprisingly, climbing fig (Ficus pumila) at our home seems to like artificial fluorescent light more than sunlight. Hi congratulations on achieving your setup. Do you think this could work in a large scale aquarium for instance 5000 litres. I know it would take along time to establish, but in your opinion do you think it could work . Sorry for the late answer. Yes, I think this concept can work for larger aquariums, the larger the better. 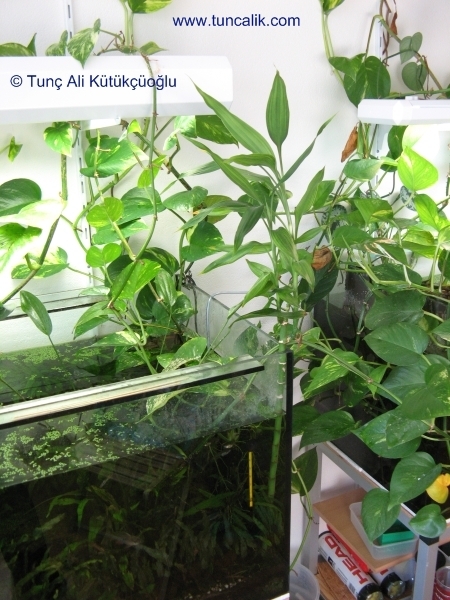 The aquarium should not be too deep, so that some marginal plants with roots at the bottom sand can grow above the surface. And natural sunlight! I think, natural garden ponds are best examples. i came across this site and was blown away by your aquarium!!! in the bottom aquarium is there anything else besides lemna minor? Yes, there are green dwarf cryptos (Cryptocoryne wendtii) and java fern. These are really hardy and sustainable plant species that can grow even under low light conditions. Hi I am new here I have a120 gallon tank with discus I would like to try and do a planted tank like yours can I use a dwarf umbrella papyrus (Cyperus alternifolius i have 15 discus in the tank.any help would be great.